The Eerie Roller Girls return to the rink and deliver a whoopin'. 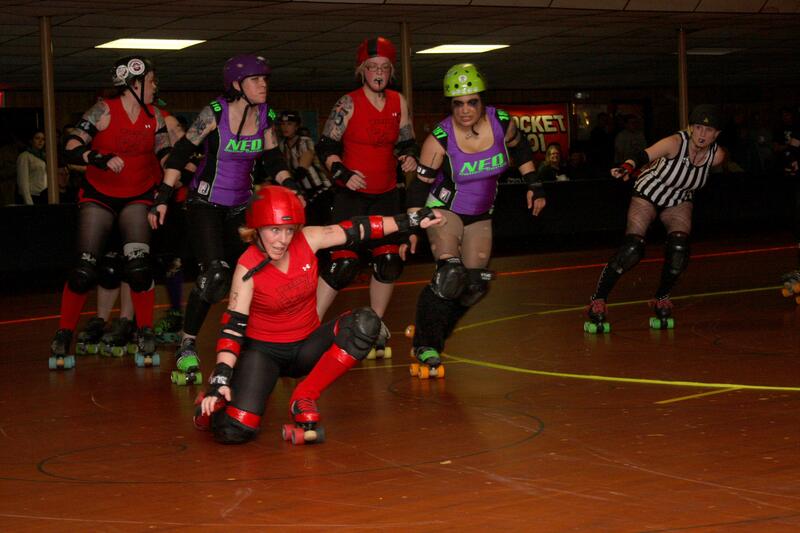 The Eerie Roller Girls took to the rink Saturday, March 24, in their first home bout of the season. Their victims—err—opponents were the Neo Audio Assault out of Akron, Ohio. When Eerie rolled onto the wood floors of Presque Isle Skating—formerly Evans Skateland—they were more than ready to get down with some hometown derby. The venue for this bout changed a bit since I was there busting a front tooth out of my face back in fourth grade. The carpeted walls everywhere were replaced with black, felt-like panels with jazzy squiggles. Everything else remains the same, but the rink's center was transformed into a roller derby track with refs in the center, team benches on the far side, and spectator seating on either end. Before coming, I re-read Jay Stevens' account of the Eerie Roller Girls that ran in the Reader last year. And whom do I sit next to during the bout? The man himself—and a great source of live-action information. Announcers introduce each player, who skates a lap and works the crowd with fist pumps, badonk slaps, or skate flare showwomanship. The names are brilliant. Eerie has "Booker T Smashington," "Vix Vicious," and "Sally Jessie RoughAsHell," to name a few. One of Eerie's newest players, "Fillina Coffins," named herself after her brother's band. "He plays in Coffin Bangers," says Coffins. Each player also chooses her own number. "I got on a cop scanner and found out 419 means 'dead body on the scene,' so it stuck," says Coffins. Besides a team jersey, uniforms become costumes since they're at the discretion of each roller girl. Hard-assed tattoos are ample, some pleated skirts sneak in, and the rest of the gear is as outrageous as it can get. Roller derby girls are masters of playing a unique persona, but no one is messing around. They're here to play. Hard. "I wanted to play rugby but Erie doesn't have that. I already play soccer and softball, but I posted on Facebook to find another contact sport," says Coffins. An Eerie Roller Girl saw the post, scooped her up, and now Coffins is out there getting thirds of rough-and-tumble. Yeah, that's how derby girls roll. No time is wasted getting the night's bout started. Five players from each team are on the floor. They line up, and behind them two jammers hunker down, ready to burst into a sprint on skates as soon as the whistle blows. Whichever jammer is the first to get through the pack ahead calls the shots from that play (jam) on. She can keep the jam going as long or as little as she wants—the basic strategy being rack up as many points as you can by fighting through the pack of opponents while your own mates block for you or call it early if the other jammer is hot on your tail. They play two 30-minute periods. With just under 12 minutes in the first period, Eerie was up 44 – 12. Just because fighting isn't allowed doesn't mean there's no bloodlust in the players' eyes. They whiz around the track while checking each other and dodging girls who are spilling on their elbow and kneepads. On average at least two women get knocked down in each jam. Eerie started out strong and stayed that way through the whole bout. "Hemmorhoidal Rage" and "The Mad Flasher," the two star Eerie jammers, made slaughtering the Neo Audio Assault look so graceful. "A woman's touch" has a whole new meaning. 'Roid Rage was the obvious MVP of this bout, helping Eerie finish the first period with a score of 72 – 12. Eerie came out even harder the second half, their wheels skidding through turns while the announcers yelled to the spectators sitting close the rink, "Look alive, suicide section, look alive!" While you'd be hard pressed to find any roller derby girl show mercy on the rink, the nature of the sport is very communal and supportive. For instance, since Eerie is still relatively new to the scene, neighboring teams, like Neo, come to help them establish the team by helping file necessary paperwork and develop skills at practice. The final score: 169 – 55, Eerie Roller Girls. After the final whistle, the aggression dissipated and it was all love. Both teams hugged one another and danced to the '90s jams the announcers turned up. I would advise Reader readers to make it to Eerie's next home bout on May 19 at Presque Isle Skating. Who knows, maybe I'll be on the rink by then.